In every catastrophic event, problems, challenges, trials and devastating situations, Filipinos are still strong. The good thing about having some downs, Philippines inhabitants’ learned to become tactful and being resourceful and those we can easily adopt and adjust on what is happening around. Encounter in Zamboanga, Tyhoon in Luzon and Southwest Monsoon Rains are some tragedies that we currently facing. Despite of those devastating events we still rational and skillful to look for any solutions either it is for a long term of short term plan. In the same page, The Philippines is located in the typhoon belt. Every year, an average of 20 typhoons enters our country. These typhoons bring rains and winds that destroy our buildings and homes. Rainy season begins on July and last up to October. On these months we experience rains and sometimes typhoons. An the worst case if southwest monsoon rain will follow that results to rapid increase of water level and flash floods arises. Whenever there is flood, or any military fight, people from affected areas need to evacuate. 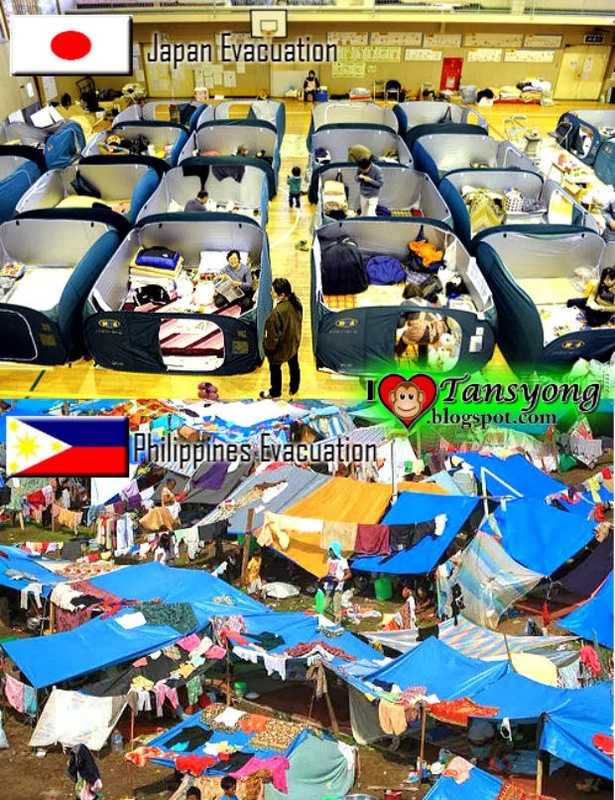 We have a lot of evacuation centers throughout our country. Usually, Schools and Churches are converted into evacuation centers. These places become crowded with families who became victims of floods or war. These evacuation centers provide temporary shelter to those people affected by the calamity. Because of that, every individual’s survival instinct become active, we become skillful and resourceful. That is one of Filipinos characteristics that we should be proud of. We are able to survive in accordance to the system of uniformity, we are able to produce a valuable thing out of nothing, we are able to feed our siblings despite of scarce resources, and we are able to smile even though there is still a tear in one corner of our eye. That’s how Filipino is. Compared to other countries we are far behind in terms of providing the needs of our evacuees. The picture above shows an example of what evacuations should look like. Each family affected was given a tent where they can sleep comfortably. They are given food, clothes, medicines and other stuff too. Government officials from other countries allocate their funds to create evacuation centers that can be used at times of emergency such as calamity. Furthermore, they have a disaster action team that is responsible for planning the rescue and evacuation of the victims. Overall, I am writing down this article due to the fact that we are currently facing problems now. The War between “Philippine Military” versus “Missuari faction MNLF forces” that result into evacuating, the increasing numbers of casualties due to Southwest monsoon rains which cause of flash floods in Zambales and Bataan (as of Sept 24, 2013). It’s not your fault if you are grew up underprivileged, BUT it’s your fault if you are allowing Poverty kill you. We are always pliant like the bamboo. That is what I always believe in. Storms and wars may try to break us but we know how to bend. And bending helps us survive.